Get in touch with us for acquiring to of the line quality Tea Bag Packing Machine! We are a reliable Manufacturer, Exporter and Supplier of Tea Bag Packing Machine in Haryana, India. 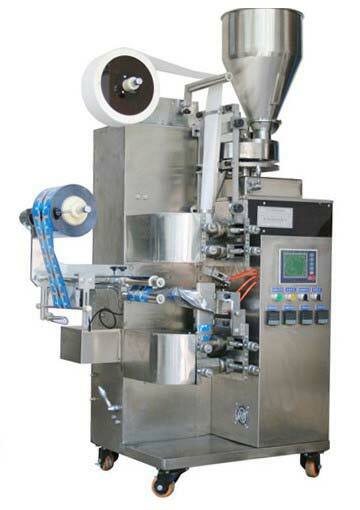 The Tea Bag Packing Machine that we bring to you is sturdy in construction. The machine is comprehensively acknowledged for being non-corrosive. In addition to this, it is compact in design assuring longer service life. Our Tea Bag Packing Machine is reasonably priced! Application : The machine is suitable for the dual bag packing of small grain like materials such as tea leafs, medicinal tea and healthy teas. It is hot-sealed, automatic and multifunction packing equipment. The main characteristic of this equipment is that it can mold in one time to protect the material from direct contact with the worker’s hands and improve the efficiency. The inner bag is filter paper tagging with the thread and label is automatically available. Controlled by a step motor, the outer seal has a fixed length and a correct position. PID is used to adjust the temperature of controller for more accurate temperature control. PLC is used to control the motion of the whole machine, with a human machine interface display and easy operation. All touchable material parts are made of food grade Stainless steel to ensure sanitary and reliable products. The attached device has functions including cutting, date printing and easy tearing. Packaging Details Duly packed in wooden box. Note : Customer is required to install Air compressor for Compressed air supply – 6kg Sq Mt.& Voltage stabilizer of 3KVA at his expenses in order to save machine from damages caused by Voltage fluctuations.